Thanks to Wayne Jackson and to Janell Mistik Barrenda for sharing some beautiful videos recently on Facebook that teach about verbs. I’ll be writing more about each of them in future posts (with thanks), because, in Cree, verbs really are the centre of everything. And that’s a kind-of-complicated lesson that beginners sometimes overlook. I’m using this post to begin to explain why. In a recent online chat, a beginner wrote something like “niya mîcisow mîcisowin” to mean “I eat food”. When I tried (as a slightly-more-experienced beginner) to explain that he needed a different form of the verb, he answered, “I’m just learning the words for now”. What he had done seems perfectly reasonable: he got a dictionary and looked up the three English words “I,” “eat,” and “food” – and he copied out the “headword” for each one. So his sentence was perfect, right? Cree and English are different kinds of languages. English is “isolating”: it likes having a separate word for everything. It’s like a picky eater: the peas shouldn’t touch the potatoes! Cree, on the other hand, is “polysynthetic”: it likes things connected. More like stew (if we keep the food analogy going) – only better organized. Nouns usually stand on their own, but verbs are made up of pieces put together like Lego. Sometimes a whole sentence in English is “just a word” in Cree. If we look at a Cree verb table, and compare the English translations, we start to see how English leads us to think this way. In English, we only need two verb forms: “eat” and “eats” (and you only need the form “eats” once!) But Cree needs a different combination of suffixes and prefixes for every person in singular and plural forms – though the “verb stem” (mîciso-) stays the same. And, in Cree, the idea of eating a meal is also incorporated into the verb, so the adding the noun mîcisowin – in this case – is not even necessary! First-language speakers have all of these beginning and ending parts hard-wired in their brains, but beginning Cree learners need to learn what the pieces are. Tables like this one – called “verb paradigms” can help learners to see those pieces in an organized way. And if you learn the pattern for one verb, it works again and again for different verb stems of the same type. As Wayne Jackson – a fully fluent Native speaker – explains at about the 10 minute mark in this video lesson – seeing a verb paradigm written out for the first time can rock your world. My beginner friend might feel cheated by the dictionary for leading him astray – but print dictionaries – in any language – are forced to choose one main form to list as a headword (linguists sometimes call this form a “lemma”) – and language students almost always have to refer to a separate reference grammar or a book of verb paradigms to help figure out the details. For Cree, the simplest verb forms – the forms closest to the naked verb stem – are third person singular (3s) forms. So whenever you look up a verb from English, the Cree form listed will mean “he/she _____s”. (And you need extra information – a whole assortment of Lego, if you will – to build proper verb forms for other persons in singular or plural). As long as Cree is all about the verbs, students will need to learn all of the prefix/suffix combinations. *sigh* But there is help! Linguists (and teachers) rely on verb tables (or paradigms) to study (and teach) the patterns. There are some great old-school tools available to help us see how this works. 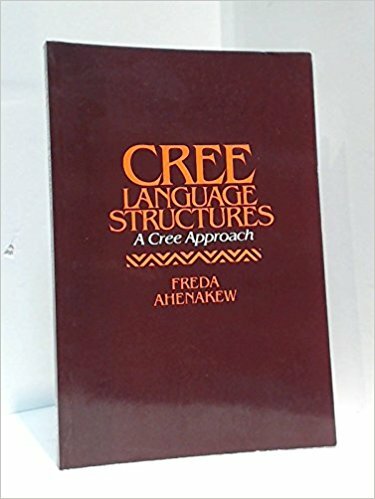 One of the best – that is still available for purchase – is Freda Ahenakew’s Cree Language Structures: A Cree Approach. This link leads to Amazon, but you can also get it through good booksellers like McNally Robinson (in Winnipeg and Saskatoon), and Audrey’s Books (in Edmonton), and most Western Canadian university bookstores. Amazing speakers and teachers like Wayne and Janell are working hard to make those tools more accessible and interactive – and in some future posts, I will talk more about their work, and how it can help language learners. Another really useful tool is the itwêwina online dictionary, currently under development at the University of Alberta: http://sapir.artsrn.ualberta.ca/itwewina/ – through the marvels of 21st-century computer technology, we can look up dictionary forms, then click through to find complete paradigms, that will (eventually) show every possible form for every verb. This entry was posted in Audio (y-dialect), How Cree Works, Video, Wayne (Goodspirit) Jackson. Bookmark the permalink. 3 Responses to It’s all about the Verbs! As a Moose Cree from James Bay, how does the Cree language you are describing differ from the Moose Cree? Is there a good reference for the Moose Cree? The standard reference for Moose Cree is C. Douglas Ellis’s _Spoken Cree_ a reference grammar/teaching guide in 3 hefty volumes. Thank you so very much for response and guidance. I will do my best as we plan a trip home in June to Moose Factory.